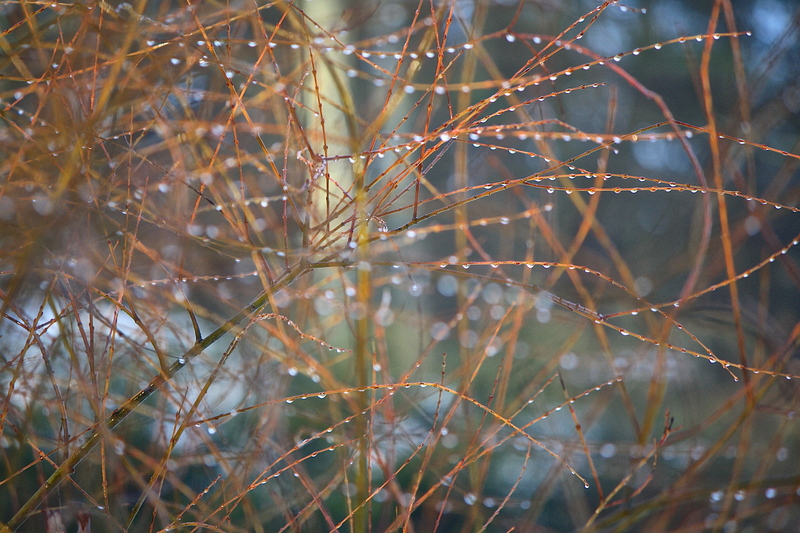 bejeweled branches, bright with raindrops, adorn my way. 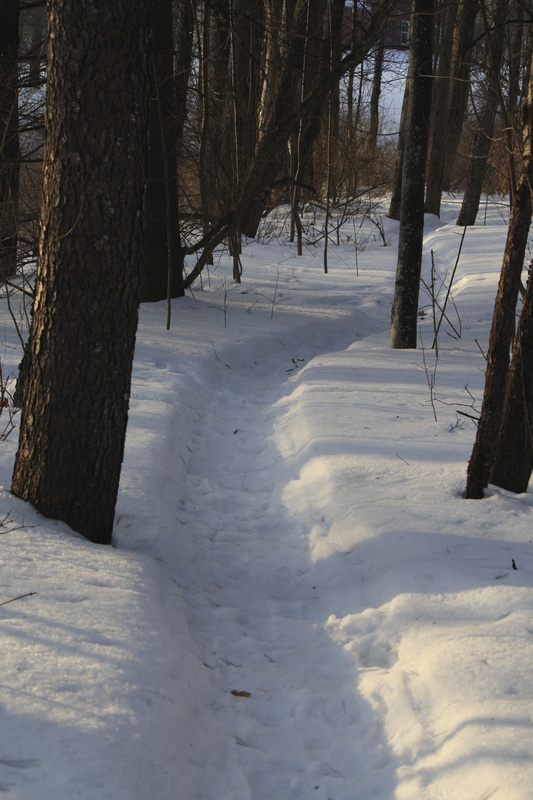 Long tree shadows stripe the snow as I take the snowshoed trail to the river. The first rays touch the trees, dispelling the mist. 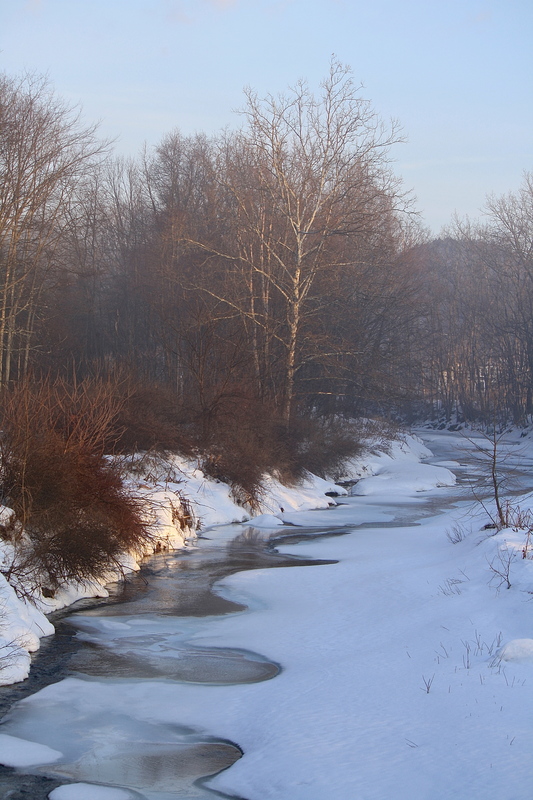 The day is warmer than it has been for a long while and the river ice is being worn away by the flowing water. 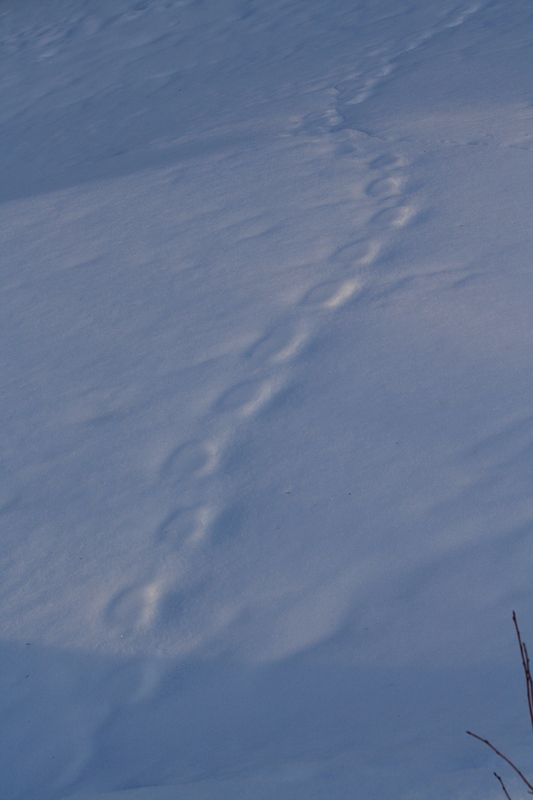 Some time ago a creature crossed the river, leaving meandering foot prints, eroded by the weather and now shadowed by the rising sun. Snowflakes glitter beneath bare branches. 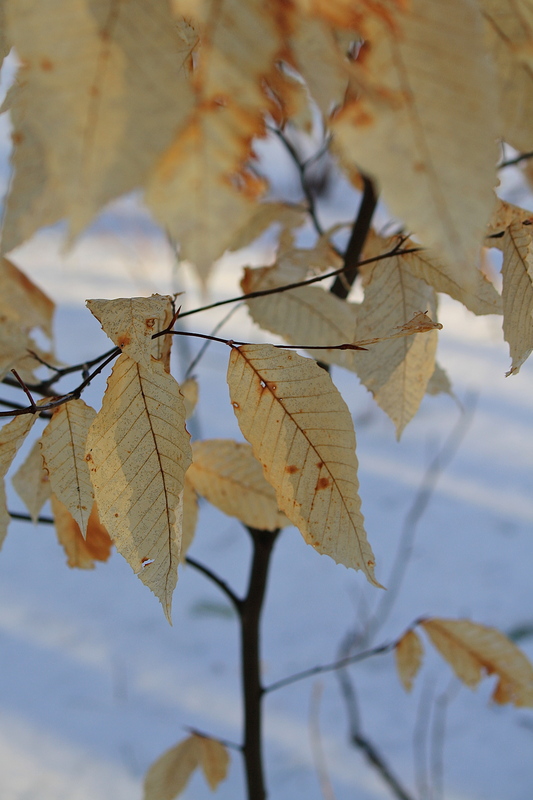 Delicate, papery Beech leaves whisper as I pass by. Heading home, I wonder how much longer it will be before winter loosens its grip and spring finally arrives. This entry was posted in Country Living, Field Notes, My Photos and tagged Beech leaves, dawn walk, foot path, nature photography, nature writing, photography, raindrops, river, shadows, sunrise, tree shadows, winter. Bookmark the permalink. Thank you for your kind comment and for stopping by, Angie. Enjoy your day! Oh, oh, oh!!! That river shot is great. The water is flowing again, Eliza, surely a good sign! Indeed, halfway there! 😉 Thanks, Barbara! You have captured your morning walk so well with your words and photographs. It is so serene & beautiful. A lovely experience for me. I couldn’t help but consider your endless winter compared to our endless summer. Over 90F here yesterday. A little more winter here would be so appreciated, as a shorter winter there would also. And as I continue searching for a new house, the same search for that “just right” Goldilocks home eludes me. Too much of this, too little of that, not a good fit, too snug. Holding pattern. Longing for the break that signals the cusp of the next change. 90 is about my heat limit, probably like 20 is your cold limit. Such different climates! I’ll send cooling thoughts your way! We slept with the air conditioning running last night. That’s unusual even in the summer time. I think that yesterday we may have found our new home. It is everything we have been looking for. Built in 1923, lots of land, lots of house, orange & figs & avocado & pomegranate & several massively tall pines. It is indeed something wonderful. Our offer has been sent out into the Universe. It was a very long & difficult day. I returned here to your beautiful pictures, and found it to be so soothing and healing. 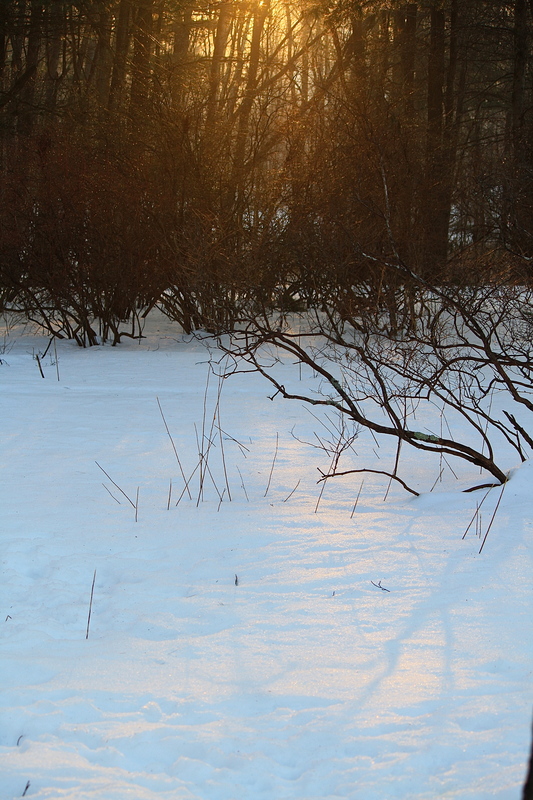 I am especially enjoying the golden light spreading from beyond the trees onto the snow. In fact, I just finished looking at a short Abraham Hicks youtube about “things you must do every day”. Of course it made me think of you – getting outside every single day and acknowledging with gratitude the gifts pouring in. Thank you Cindy. 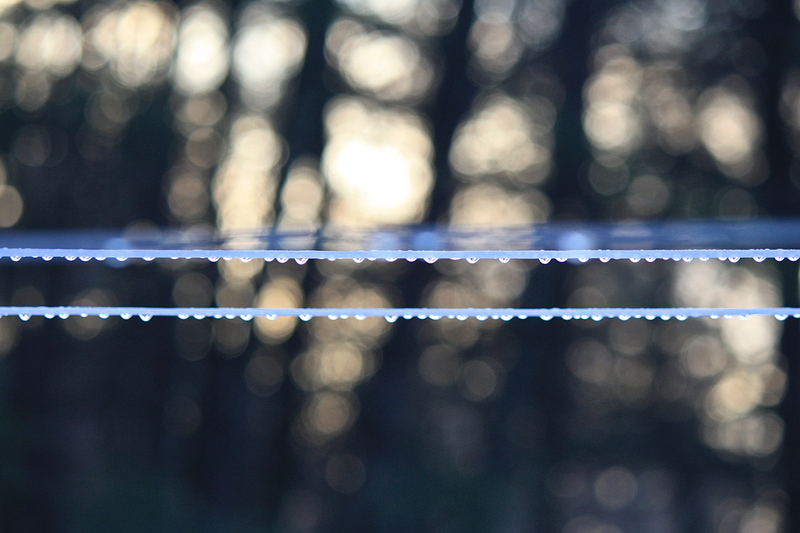 You like my clothesline? 🙂 Can’t until I can start using it again! A few weeks more to go. Beautiful words and images. Love your bejeweled branches! I hope so – the sap is running! Beautiful – so strange still to see the snow when all is getting so green here. I bet the spring will come all in a rush! Just beautiful. Our snow is all but gone. Hope yours melts soon. Thank you, Gigi. Yeah, it’ll be a few more weeks. We’re in the home stretch! Thank you, Diana. It’s not so cold as it was a month ago. Spring is coming! 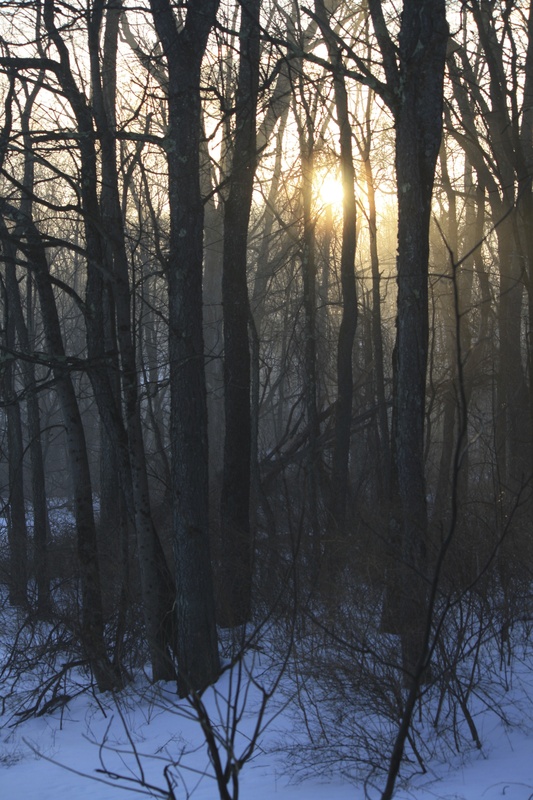 I can feel the crispness in the air … and the promise of Spring in the light. You deserve what I said, Eliza. Your work is so good!!!! Thanks so much! This was definitely the winter to be abroad, as I’m sure you know. Spring is slowly arriving here. Oh, what a great analogy! It is like Christmas, particularly when things start popping out of the ground – everyday a new surprise! Thanks, Heather. Have a great week. Beautiful descriptions and lovely photos. Thank you for sharing the beautiful part of your world. Such beautiful photos! You have really captured moments. I almost feel like I was there — crisp air and snow crunches underfoot. Wow. What a gorgeous walk. I really love that last shot. I so love being brought into your world! 🙂 Thanks so much for saying that, it is my pleasure to present it! Thank you, Robin. Yes, “soon, soon” spring will come. It is Nature’s joke on us to snow on the first day of spring. 🙂 It was 14 this a.m. and probably another day of that before the snow comes to ‘warm’ things up. The sun will prevail eventually. Thanks for stopping by! Beautiful photography as usual. I seems the climate is getting better. Of course! I am honored! Thank you! Eliza, such gorgeous photos. I have been away (camping again!) and have just also caught up on all your black and white photos, too, which are so lovely. Thank you for your blog posts, which always light up my day. Thanks so much Rebecca! You are kind. 🙂 Camping sounds like fun, it’s nice to get away from the day to day routine. I really like your beautiful photos here. It is so hard to hang on through the last days of winter, isn’t it? 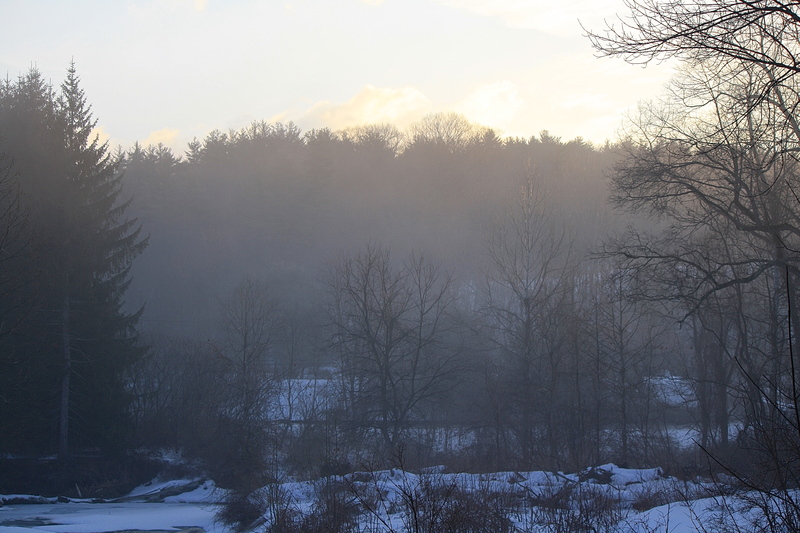 But I like it when there has been a rain and then mist rises from the snowy ground. Thank you Melissa! Do you still have snow? Ours is still out there, but there is less of it each day. Two days above 50 has helped melt a lot! 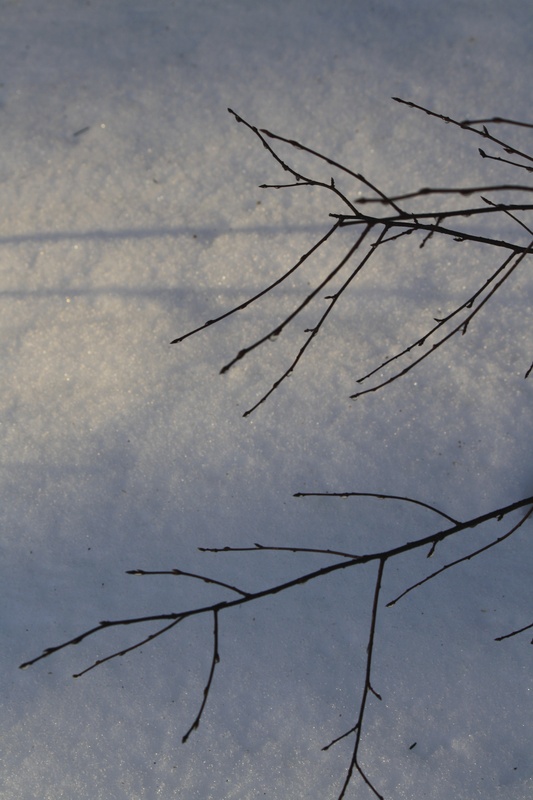 We still have strips of snow where shadows linger, but the birds are here to lift our spirits. Have they arrived there yet? The birds are late this year (how do they know?) I’ve only heard two redwing blackbirds, but no northern peewees yet, which are often the first to arrive. I’ve seen turkey vultures migrating all week. I heard a song sparrow yesterday along the river, a happy song!